Claude T. Smith was one of America’s most prolific and influential composers for band until his untimely passing in 1987. His harmonic style was colorful but firmly rooted in tonality. He is especially remembered for his rhythmic innovation—particularly the frequent use of asymmetrical meters and rhythmic ostinatos. Indeed as a teenager, it was in a Claude Smith composition that I first encountered 7/8 meter. Smith was also a horn player and his writing for brass is satisfying and robust. 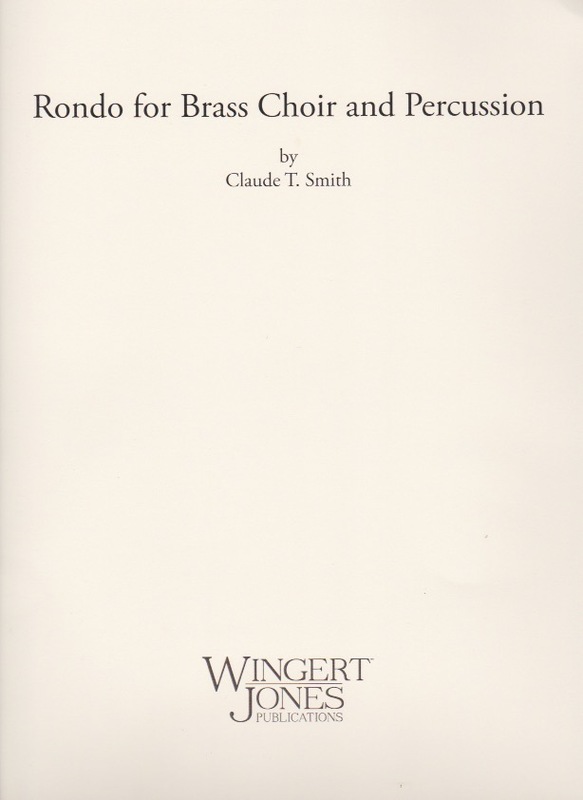 Rondo for Brass Choir and Percussion for 12-part brass choir and full percussion was commissioned by the Phi Mu Alpha chapter at Central Missouri State University where Smith served for many years. It is a flashy, aggressive work that contains many of the compositional devices that first endeared us to Smith. The opening rondo theme features an extensive rhythmic ostinato in the trombone section. The trumpet and horn sections float above the ostinato with complementary soaring and sustained melodies. The B section features rhythmic motivic interplay. Sixteenth motion abounds and each part has an interesting and challenging role to play. The trumpets use a variety of mutes, further coloring the expression. The C section changes mood dramatically. It is a serene hymn-like section containing a beautiful trombone solo. The trumpet players switch to cornets and flugelhorns, lending a mellower reverence. A Dal segno revisits earlier material, extending the rondo form, and the work closes with drama and flair. The Rondo for Brass Choir and Percussion is challenging, but a lot of fun to play. It can equally open or close a concert. It is a fitting reminder of why Claude Smith was beloved as a composer.